In a fine sieve, pick over the dal and rinse thoroughly. In a 3-quart saucepan, heat the oil. Add the onions, garlic, ginger, turmeric, and carrot, and saute for 2 to 3 minutes. Add the dal, water, chopped tomatoes, curry powder, and pepper. Simmer over medium heat for 35 minutes, until the split peas are soft. Cool. This delicious soup is one of my favorites because the coconut milk lends a sweet, creamy taste. 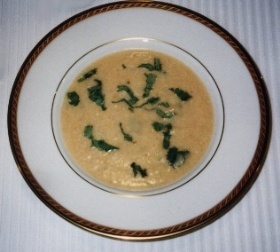 Any commercial brand of curry powder can be used in this soup to get authentic results. In a food processor fitted with a steel blade, or a blender, puree the split pea mixture. Strain the soup through a sieve into the saucepan. Add the coconut milk, salt, and cilantro. Gently simmer for 5 minutes. Serve hot.